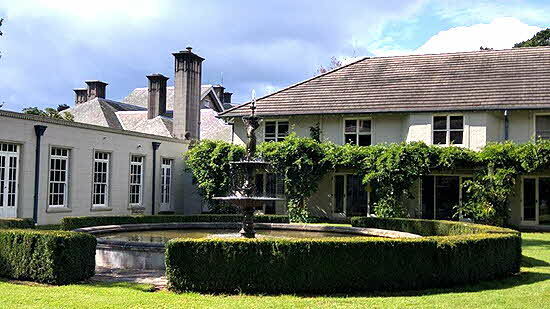 Arched Palladian windows... stately stone urns... dappled pathways... are signature features of Milton Park an historic resort in the manicured rolling landscape of the Southern Highlands an hour south of Sydney, Australia. Originally called Mansfield Farm, it was purchased in 1910 to be the country home of one of the very social Hordern brothers, and became known for breeding top cattle and for its magnificent gardens designed by Anthony Hordern and has wives Viola and Mary. Driving in through imposing stone gates down a tree-lined driveway, the iconic mansion, said to be a 20th-century icon, is entered through the door at the porte-cochere. 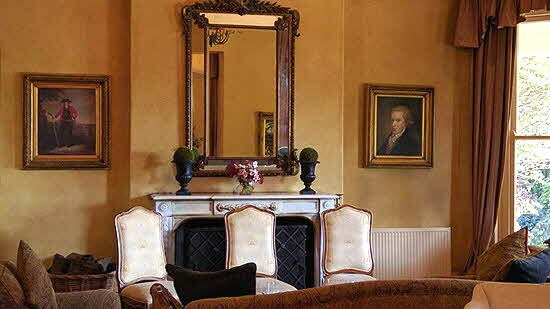 Its living rooms now provide comfortable reception and seating areas for reading and chatting and sipping tea in the manner of the Golden Era when wealthy estate owners fled here to escape Sydney's summer heat. Beyond the check-in desk, the Polo Bar is lined with a wall of iridescent liquor bottles with a billiard room behind. Windows in the Conservancy, Orangerie, and Hordern dining rooms frame views of the trees, greenery, and colorful birds outside. 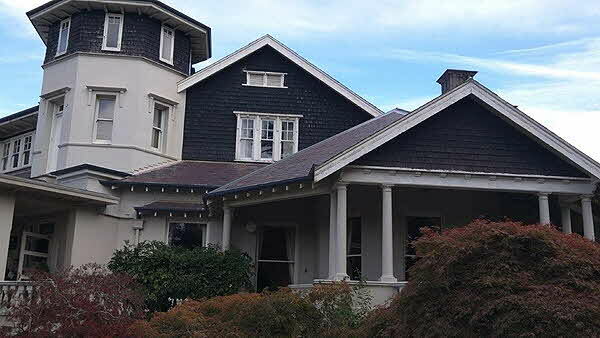 Three floors of guest rooms adjoining the main house are centered around paddocks and lawns with fountain views. Window doors on ground floor rooms open out to seating on grassy terraces. With antiques and French Provincial furnishings, guest rooms and suites are spacious, with king size beds, comfortable arm chairs, convenient tables, and writing desks. Giant armoires conceal big-screen television sets with ample drawers underneath to supplement the closet storage. Each room is fitted out with a safe, small refrigerator, ironing board and iron, hair dryer. Marble counters in the roomy bathrooms provide space to spread out cosmetics beside the rosemary scented amenities. Two-seat baths and open fireplaces are features of most suites. 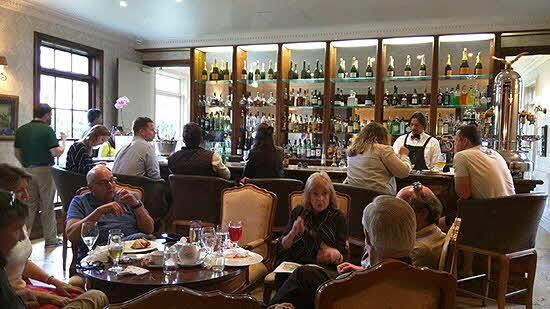 Many visitors come merely to admire the gardens and to dine. Chef Matthew Byrne's seven-course Degustation menu at Hordern's includes vanilla butter lobster tail, foie gras terrine with smoked duck, crusted Victorian venison with parsnip puree, lillet blanc sorbet, a vanilla pear compote -- all paired with local wines. Orangerie highlights include pan roasted lamb loin with parmesan and wild mushroom risotto and slow cooked wagyu beef cheek. The breakfast buffet is offered in the Conservatory and meals can also be served on the Terrace or room service. 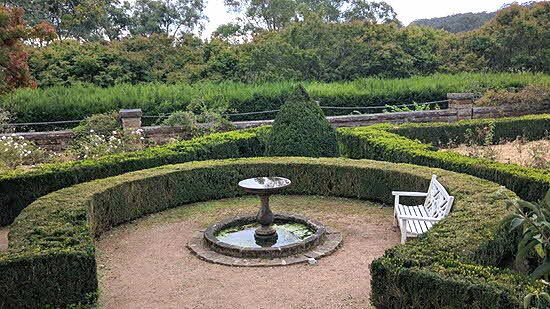 Surrounding gardens, described as Australia's finest, lie below the mansion. Over time, the original formal geometric Edwardian plan has softened, redesigned into a series of gentle terraces culminating in the rose garden. Visitors are invited to follow self-guided tours down stone walkways leading along the Fairy Path to the Rose Parterre or down the Wisteria Walk which passes the Sunken Garden. The French Pool House lined with high arched windows houses the full-size swimming pool. Swimmers can look up at faux paintings depicting blue and white urns and a bird on its walls and actual birds can be spotted beside the real urns on the its outside terrace. 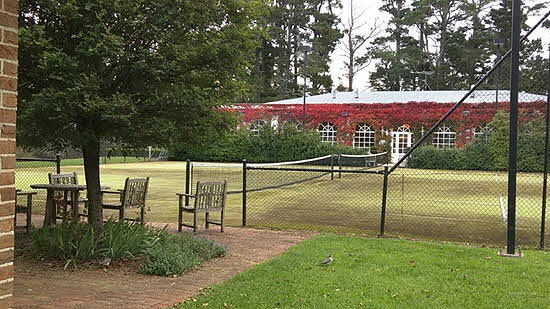 Up the hill beside the tennis courts, the spa houses a large Jacuzzi, sauna, and good hot steam room. Treatment rooms provide space for Jojoba bead body polish, Sodashi infusing, mineral, and age-defying facials, eye-lift, body toner, and mint foot therapies. The hour and a half Gentleman Package includes a back exfoliation and massage and a mankind facial. Picturesque nearby towns provide opportunities to shop and sight see, but many visitors are content merely to enjoy the views, hospitality, and service of the stately estate.